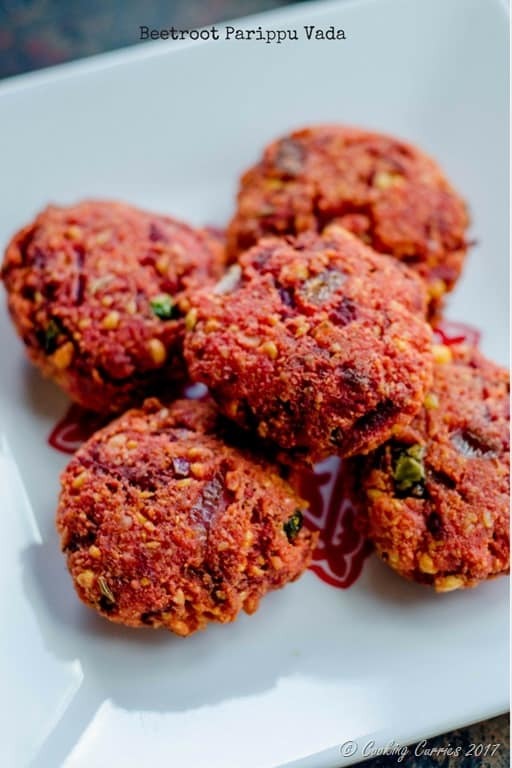 Protein and nutrient packed Beetroot Parippu Vada has the goodness of lentils plus the beets in it, making it a perfect after school snack that is both filling and tasty! 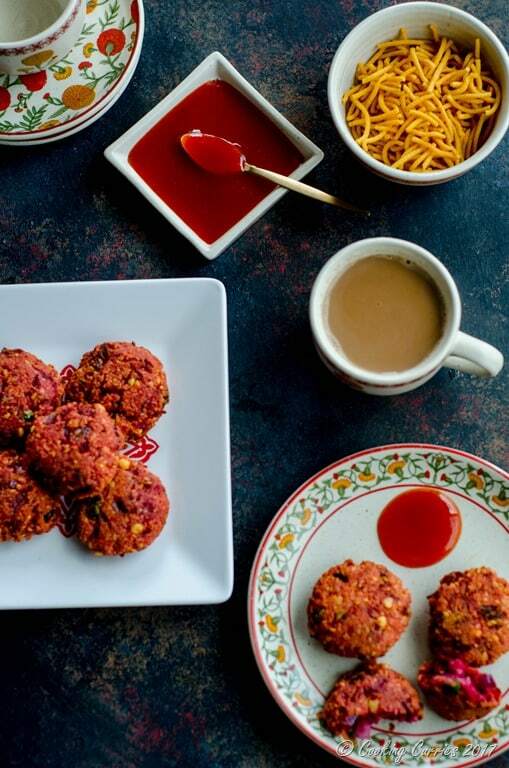 Parippu Vada is a quintessential tea time snack that is very popular in the Southern states of Kerala and Tamilnadu. You can often spot it alongside the roads from the aroma of fresh vadas being fried in little carts that serve tea and fried snacks. You can often get a few on a paper plate doused with delicious coconut chutney or you can get some for take out, wrapped in newspapers. 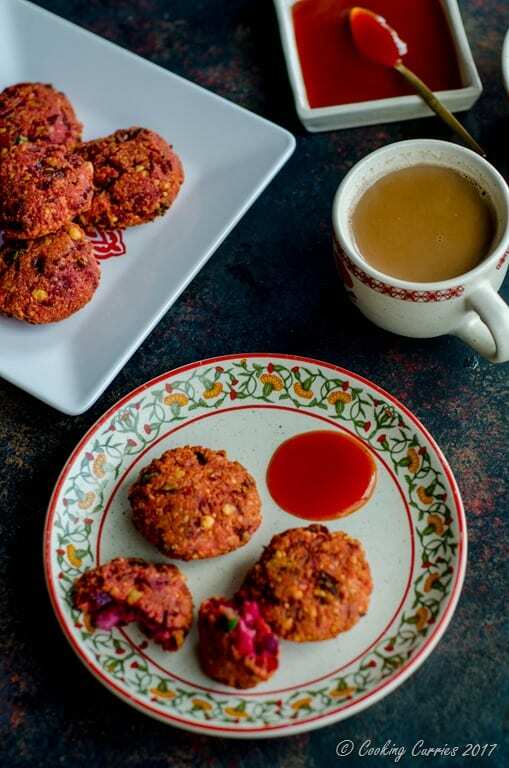 This beetroot parippu vada is a twist on the parippu vada with some grated beets added to it for some extra healthy yummies and some color that will tempt the littles to eat some as well. It is a perfect after school snack to fill those hungry tummies with something they love and you feel good about, at the same time. 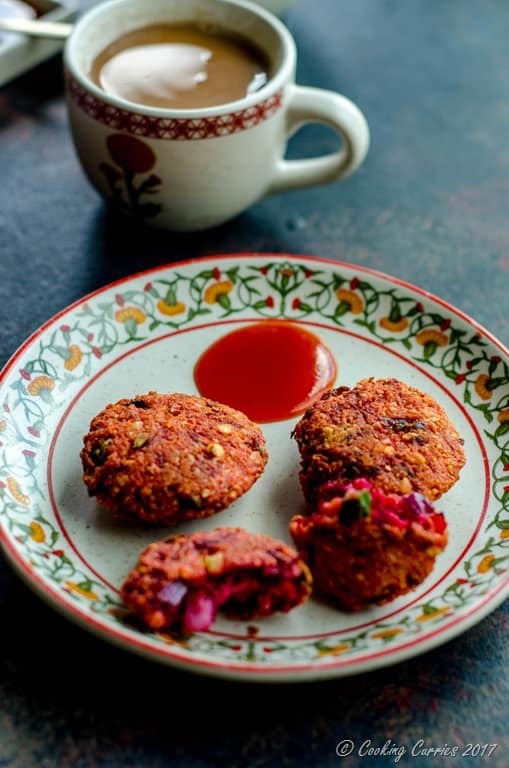 Parippu vadas are my go-to snack to make if I have people over for chai. It just needs 20 mins of soaking time and you can fry it as you are making chai on the other stove. They are also hard to screw up. Just go a little heavy on the seasonings as the chana dal can stand up to it and you want it to still be there after all the deep frying. We also love these snacks to serve for chai time! Soak the chana dal with the dried red chillies for at least 20 mins. Drain and grind the chana dal and chillies to a very coarse paste. Tear the curry leaves with your hands and add this to the dal mixture along with the grated beets, chopped onions, Thai green chillies, asafetida and salt. Mix well. Heat the oil for deep frying. Take about 2-3 tbsp of the dal mixture in your hand, roll into a ball and flatten to form patties about 1/4 inch thick and lower gently into the hot oil. After a couple of minutes, flip over and fry till the vadas are crispy. Drain on paper towels and serve hot with your favorite chutney. My little girl loves the beautiful pink color. I am going to try this for her.